Sup, dawg! If you’re a trend playa, then you may wanna check out today’s intraday charts update ‘coz I’m serving up an Aussie + channels + comdolls triple combo, with AUD/CAD and AUD/NZD on the menu. AUD/CAD has been tilting lower recently. And if we connect the most recent peaks and troughs, we can see the pair appears to be moving ever lower while bouncing up and down inside that there descending channel. 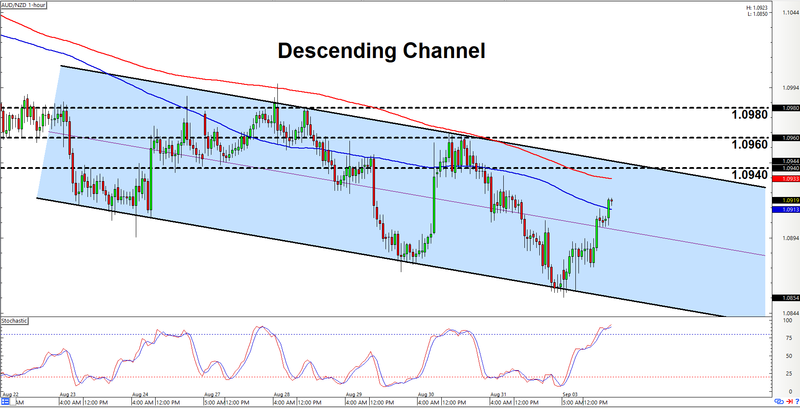 And presently, the pair is making its way up towards the channel’s resistance area at 0.9480. Y’all may therefore wanna get ready to start lookin’ for opportunities to go short. Looking at our technical indicators, however, there seems to be a chance that the pair may move back down again without testing resistance at 0.9480 since the pair is approaching the 100 SMA but stochastic is already signaling overbought conditions and all that. Waiting for the pair to test resistance is the safer way to play, though. Anyhow, just be reminded that there’s always a risk that the pair may stage an upside channel breakout. Such a scenario seems unlikely at the moment. But if such a scenario does play out, then a move higher past 0.9520 would be an early sign that bulls are taking over. And if the pair keeps moving higher and takes out 0.9560, then y’all may wanna think about bailing yo shorts (or even switching to a more bullish bias). 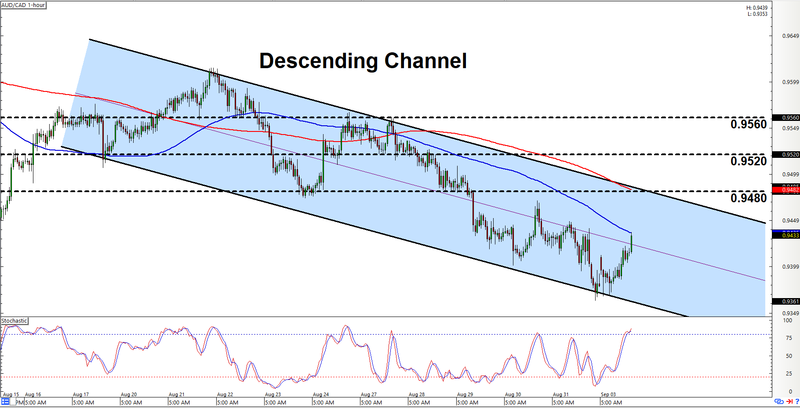 A descending channel has also recently formed on AUD/NZD’s 1-hour chart. And as y’all can see, the pair will soon be testing the channel’s resistance at 1.0940. Y’all may therefore wanna get ready to start lookin’ for a chance to go short, especially if resistance holds. And all the more so, given that them moving averages are still indicating a healthy downtrend while stochastic is already signaling overbought conditions. However, just keep in mind that there’s always a chance that the pair may stage an upside channel breakout instead. The pair would need to clear both areas of interest at 1.0960 and 1.0980 before the topside breakout is validated, though.